Daddy’s pizza is the best! DADDY'S PIZZA IS THE BEST! There is nothing like homemade pizza. And my man tosses the best pizza pie! For a quick weekday dinner, we buy the dough in a frozen ball (found in the deli at the grocery store). Defrost it on the counter all day. We like either Don Pepino or Furmano’s canned pizza sauce. Most of the family eats cheese (just a lot of shredded mozzarella), and mama likes veggies. 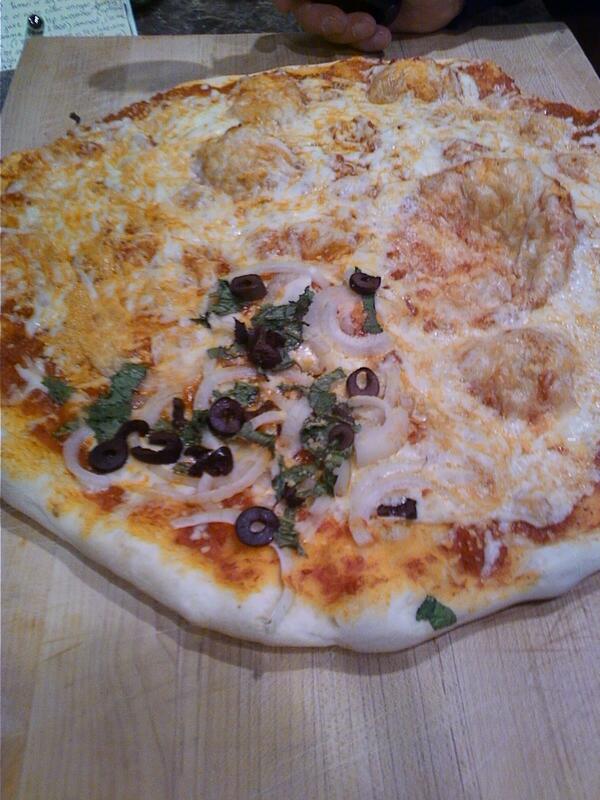 Tonight my slice was sweet onion, fresh basil, and sliced and pitted kalamata olives. MMMMMM! My typical corners have any of the following: sliced tomato, feta cheese, pesto sauce, banana pepper slices, bell pepper (green, or red/yellow/orange), basil, kalamatas, and ALWAYS sweet onion.
. . . il mio piatto preferito? Pizza con pomodoro e cipolla.